The entire landscape of trade has transformed in the last two decades. It had long ago shifted from the grudging offline experience to the easier and comfortable e-commerce experience – where everything could be bought or sold by a click of button. I am quite certain that most of us are pretty much aware of that. 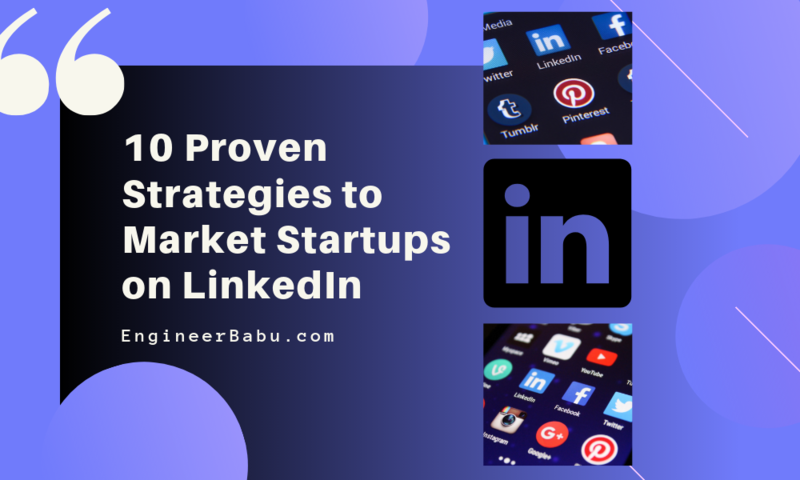 It is also safe to assume that almost every one of us might have either heard of or used some of the services of the companies mentioned in this list. 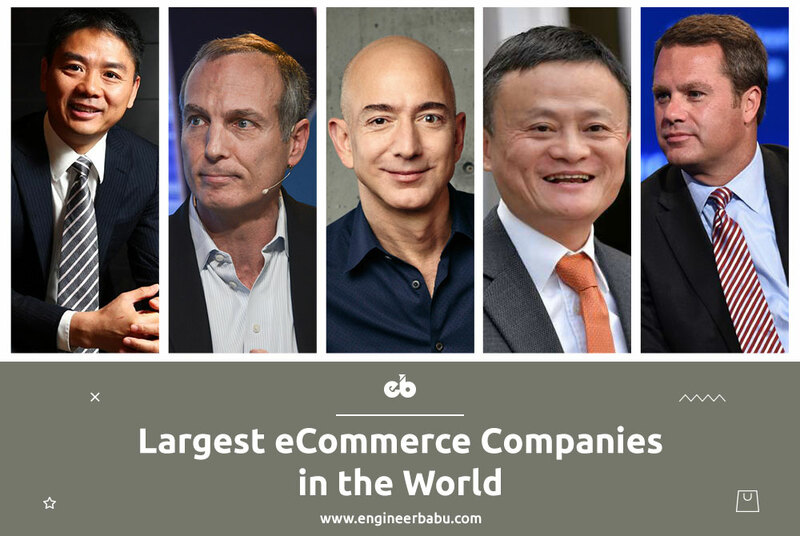 The ecommerce landscape is dominated by the worlds’ elite – Billionaire businessmen like Jack Ma, Jeff Bezos, and others, are in a relentless race to dominate the ecommerce realm. 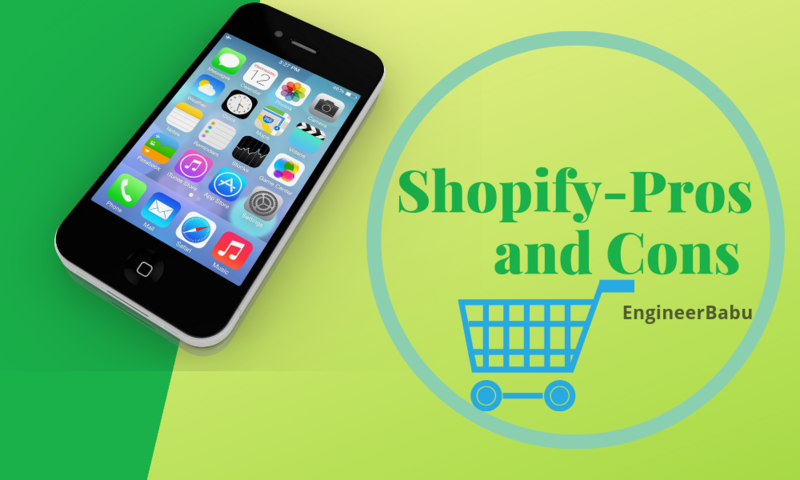 After all, the ecommerce industry is without a doubt the most lucrative business of the 21st Century. 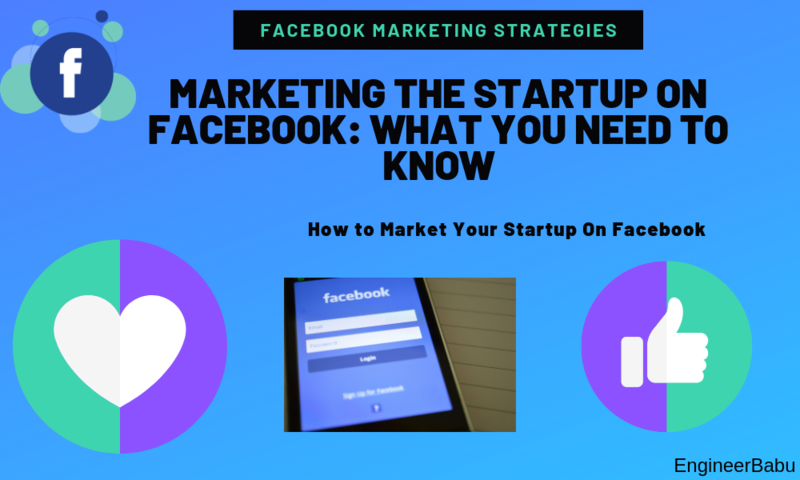 Now, one might assume that he or she knows pretty much everything about the companies listed below, but I am pretty certain that you might not be aware of the secret sauce that made these companies so influential. Let’s shift our paradigms a little, and shed some light at these corporations from an entirely fresh and quirky perspective. Only if you are living under a rock or were in a Captain America sort of coma for a while, could be the case when you might not have heard about this giant-little bird. This Seattle based company (rather a country) is now the most valuable business in the universe. But this isn’t the only thing that makes headlines about Amazon. The now immortal CEO of Amazon is equally in the news, if not more. 2018 saw Mr. Bezos become the first centi-billionaire of the world. His net worth is estimated to be a whopping 137.1bn USD (meh! )as of 2019. So, what precisely goes inside the head of this gentleman? Read through this image of Amazons’ 1997 letter to shareholders, and you’ll get an impression of how this gentleman thinks. Amazon has been a constant with their purpose since its inception. In their annual letter to shareholders, they have always boasted the view of long term and valuing their customers more than anything. 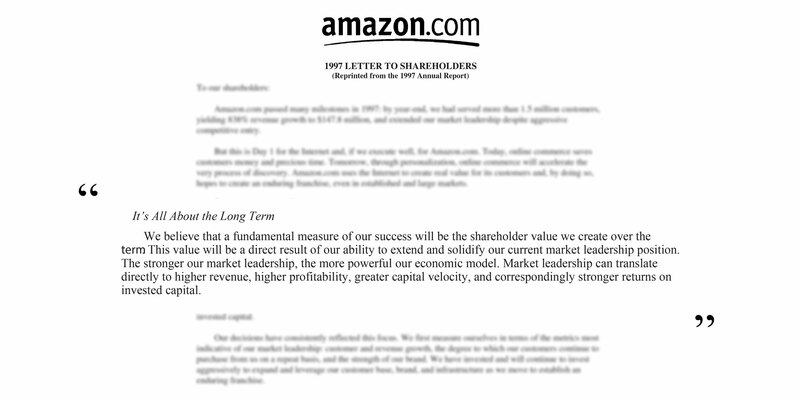 Amazons’ 1997 letter to shareholders, gives us a pretty good insight into the way Jeff Bezos functions. The letter tells us about the unrelenting focus the famous founder has maintained through the years, along with some invaluable lessons for all who are pursuing organizational excellence. Too many companies today are focussed on maintaining slim profit margins, at the expense of keeping customers happy. 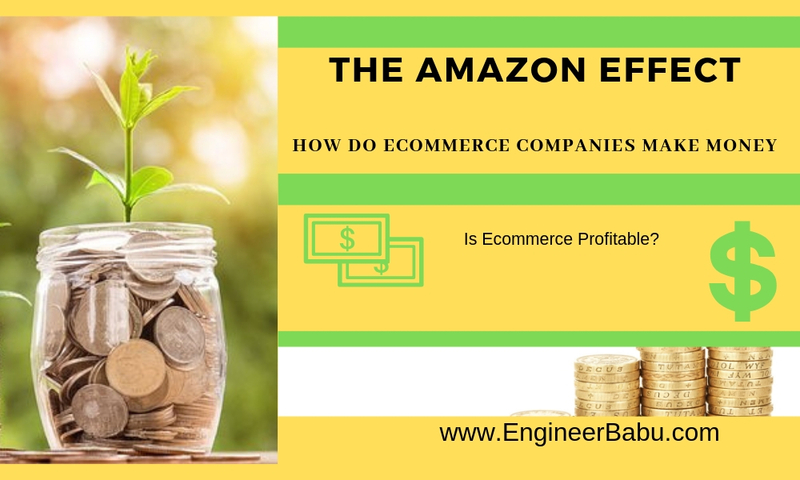 Amazon, however, has always been laser-focused on providing value to their customers.“Since inception, our focus has been on offering our customers compelling value. We brought our customers’ much more selection than was ever possible in a physical store (our store would now occupy six football fields), and presenting it in a valuable, easy-to-browse, and easy-to-search format in a store which is open 365 days a year, 24 hours a day.”, explained Bezos.The fruits of this resolute mentality could be clearly seen 25 Years later. Customer First. ALWAYS. NO MATTER WHAT. Amazon as a company has always strived to keep customers at the helm of their business. Amazon’s emphasis on the long-term, as shown by the image above, has made investment decisions in the light of long-term market leadership considerations rather than short-term profitability considerations or short-term Wall Street reactions. There are swarms of people that don’t agree with this approach. But then again, not everyone can build a business like Amazon. Another critical reason why Amazon has rose-up to the top is their willingness to learn from their mistakes. In an interview, Bezos acknowledged the road ahead, “We now understand vastly more about online commerce then when Amazon.com was formed, but we still have so much to learn. 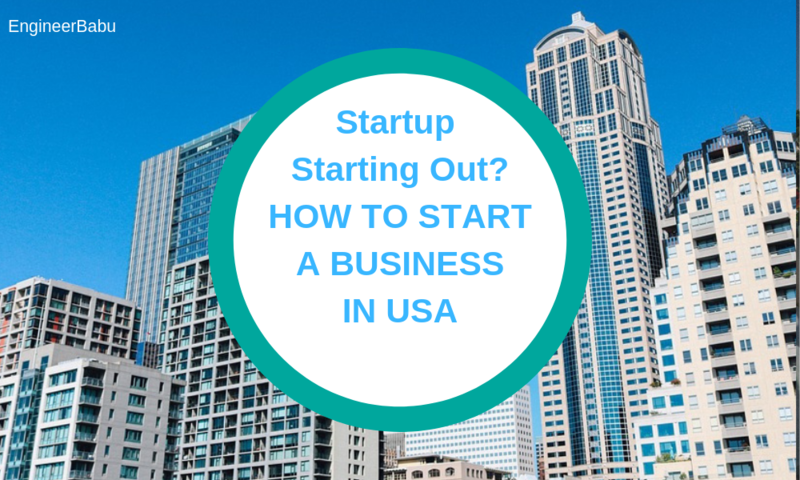 Though we are optimistic, we must remain sharp and maintain a sense of urgency.”Every entrepreneur and businessperson should try and inculcate this in their business. Rather than eyeing short-term profitability, Bezos has always tried to focus on long term gains. 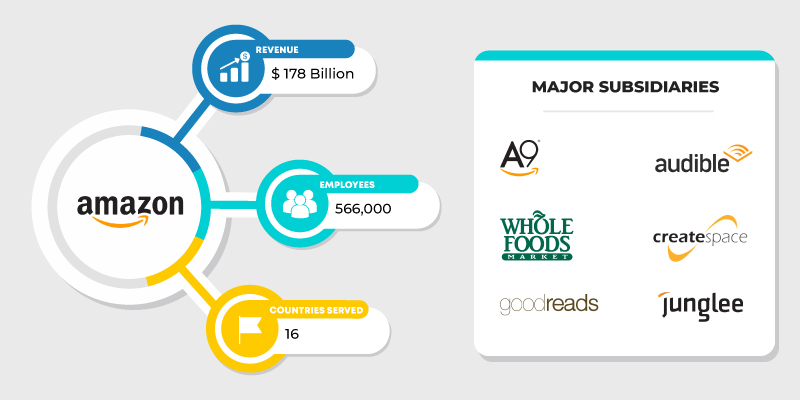 Their refusal to compromise has given the company purpose and direction – and has transformed Amazon from an online bookseller to a global retail empire. Walmart is not just the world’s largest retailer (but Amazon is closing in), it is also the world’s leading private employer. Walmart products are manufactured in more than 70 countries. At any given time, Walmart is managing an average of $46.18 billion in inventory (Q: Oct 2018) throughout its 11,695 stores operating in 28 countries. 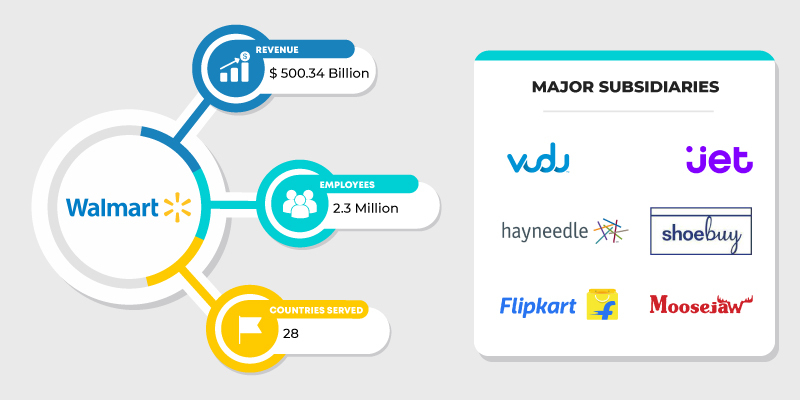 To top that, they have made several significant acquisitions (Flipkart being the most notable one) to compete with Amazon in emerging markets like India. Walmart’s influence has been so immense that its impact on communities and society as a whole has been a consistent topic of academic interest in a variety of areas. While Walmart is celebrating success, other major retailers are struggling. Macy’s, the nation’s second-largest department store, had its share price plummet. For fiscal 2017, the retailer is projecting a 3.2 to 4.3% decline in sales. J.C. Penney saw a 15.3% decline following its weak earnings report. And Nordstrom, revered for its customer service practices, saw an 11.3 % drop, while Kohl’s slumped nearly 8% after disappointing financials. SO, why is Walmart winning when most of the retail markets are tanking? Sam Walton started Walmart in 1962 with one simple goal: to “help people save money so they could live better.” Despite its humongous size, the organization has never lost sight of its purpose. Even today, helping its customers save money and that is central to everything Walmart does. Their unwavering and laser-sharp focus makes them stand-out. Alibaba is hailed as “the Amazon of China” because of its dominance in the worlds’ most populous country. 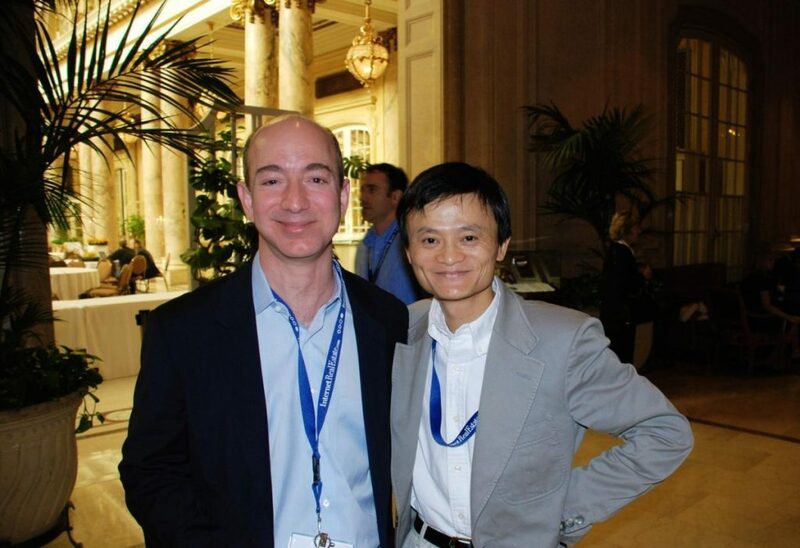 Much like Amazon, the founder CEO of Alibaba boasts a big fanbase and is touted as a global entrepreneur and visionary. Alibaba has been killing it since the dawn of the 21st Century and is on its way to dwarf American stalwarts such as Walmart, Amazon, and eBay. It has already outperformed Amazon, Google, and Microsoft in key areas such as public cloud revenue growth. 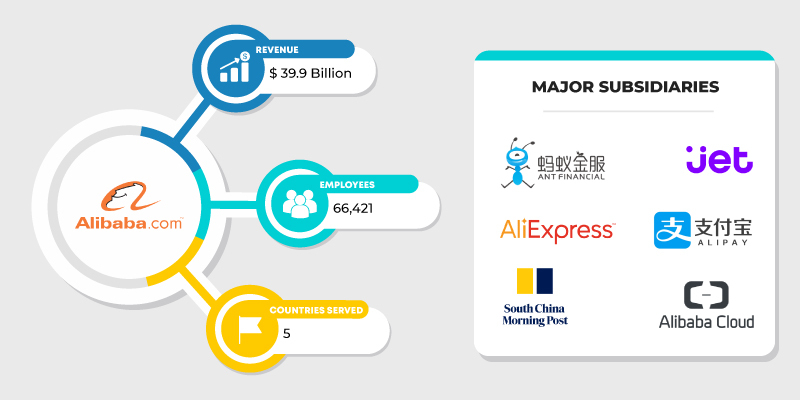 With entities almost everywhere, (movie production, music and movie streaming, online learning, micro-blogging, online maps, travel booking, mobile apps, and so much more), the Alibaba Group has shown the world that China is a force to be reckoned with. Alibaba doesn’t charge a single penny for admission and only charge for their services in marketing and technical support. This contributes to a significant and robust market-share made up of loyal customers. Alibaba’s profits mainly come through keyword biddings and advertisements, which represent 55% of its total profits.The second most important source of profit (amounting to almost 25%) comes from the technical services based on big data of the consumer behaviour.By eradicating intermediate fees and allowing sellers to register for free, Alibaba has been able to cultivate an online transaction habit among its customers. Jack Ma has taken carpediem way too seriously. Alibaba has always excelled at identifying and seizing unique business opportunities and thus cleverly positioning itself as a leader in developing customer loyalty.For instance, The ‘Double 11’ festival falls on Nov 11, between Christmas and the Chinese National Day. Most consumers initially avoided shopping during that period, but Taobao (a subsidiary of Alibaba) has successfully transformed that day into an actual shopping festival. If anyone in this world can lock horns with the likes of Alibaba is this ecommerce giant – JD.com has started giving Alibaba a run-for-money by introducing advanced technologies and drone delivery systems. They have also announced that they are planning to build more than 150 drone launch centers to improve delivery capabilities for consumers in rural areas. 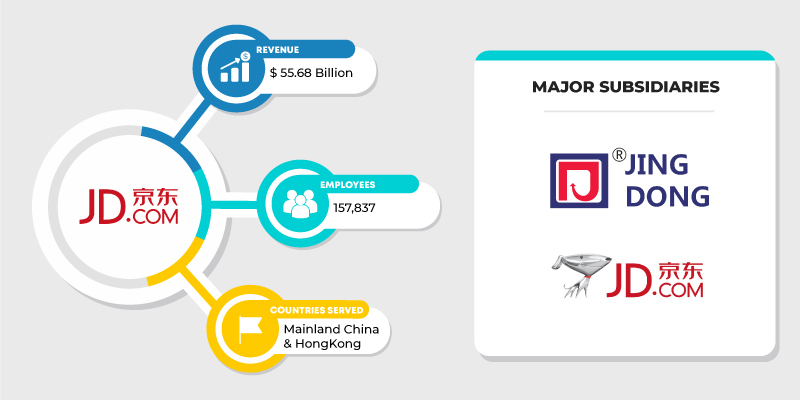 Additionally, JD is in a strategic partnership with Walmart that was extended this year to further the integration of their resources, platforms, and supply chains within China. Strengthened by initial failures, Richard Liu Qiangdong, took risks that paid off heavily, mounting his startup JD.com into the ranks of Chinese e-commerce giants. “Within five years I’m 100 percent sure we will be the largest B2C [business to consumer] platform in China — we will surpass any competitor,” said Liu in a statement to Financial Times. 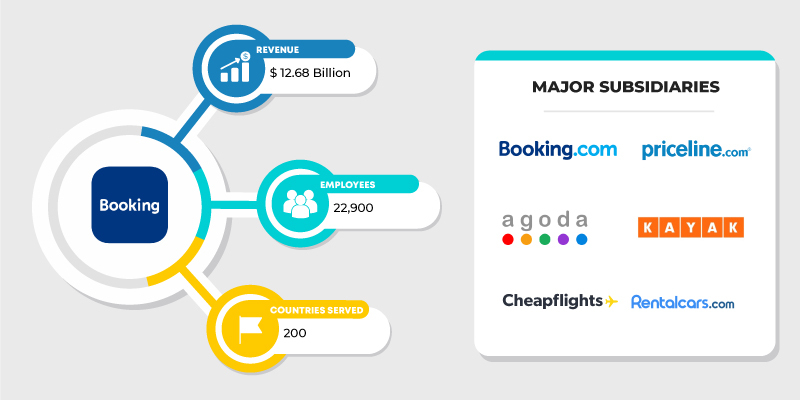 Booking Holdings is the only travel fare aggregators that has made it to this list dominated by retail giants. But there is good enough reason to mention them here. According to sources, Booking Holdings operates websites in about 40 languages and 200 countries. In 2017, consumers booked 673.1 million room nights of accommodation, 73 million rental car days, and 6.9 million airplane tickets using websites owned by Booking Holdings. Booking Holdings stocks touched an all-time high of $2,229 per share in the first quarter of 2018. Booking.com operates websites in about 40 languages and in 200 countries, which is quite a feat, considering the market they operate in. Booking.com had a total of roughly 29 million reported listings, of which 23 million were listings in hotels, motels, and resorts and almost 6 million were listings in homes, apartments, and other unique places to stay.Their plans to consistently grow its reported listings, expand its real estate on its online accommodation, booking website, and improve its technological capabilities help them lead the herd. Judging from my personal experience and from those of others, Booking Holdings reliable customer service and their competitive pricing with easy-to-use user interface draws repeat purchases. Their business model thrives on repeat purchases. They aim to provide a better holistic travel experience to their customer, which reaffirms its value in the market. One of the several interesting ah-ha moments we had while preparing together this analysis, and which surprised us the most was the level of consolidation that is undergoing within retail. Major acquisition activities included purchases by private equities and retailers buying Internet companies and other ecommerce players. Like the recent acquisition of Flipkart by Walmart – Walmart outbid Amazon to buy a controlling stake (77% for $16bn) in the Indian ecommerce giant. The acquisition is touted as the biggest ecommerce deals of recent times. This goes on to show that big-box retailers are eyeing emerging markets like India to strengthen their foothold across the globe and at the same time get an edge over their competitors. The sudden shift in focus from markets like the US, Canada, and the UK is due to the stagnancy that the developed markets are witnessing. 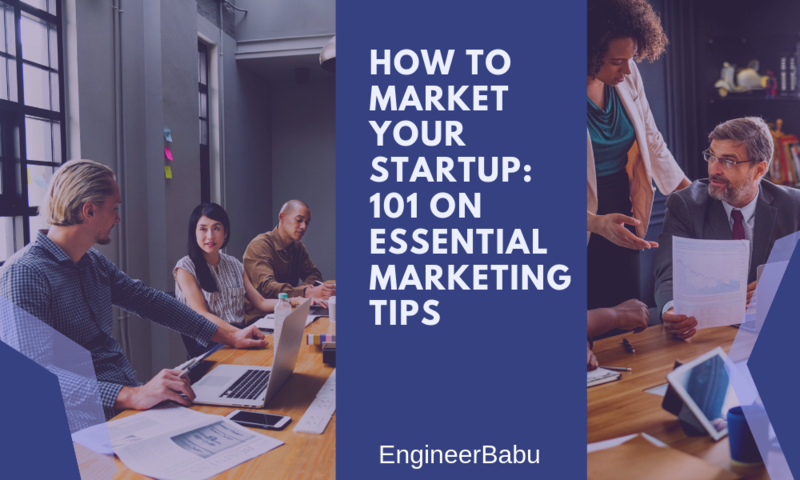 EngineerBabu prides themselves in creating some of the best ecommerce solutions for businesses worldwide. Our dear Australian ecommerce customer Frankgreen has won several accolades such as the Best Design Award for not one, not even two, but three consecutive years!! Another ecommerce application Ondoor (an online supermarket app) created by developers of EngineerBabu have garnered more than 100k downloads in record time. A Detailed Guide to CSS Animations and Transitions.